I am in the process of migrating all my websites from GoDaddy’s Classic Linux hosting to the newer cPanel hosting. As part of this migration I need to migrate over my websites’ email from GoDaddy’s Workspace email to cPanel email. First thing I did was backup any emails that I wanted to keep. Fortunately, for the domain email that I am moving, I didn’t want to keep any of the emails so I didn’t actually need to do a backup. Note: it does not appear that there is an export function in the SecureServer webmail program. If I find out more about this, I will update this post. Next, was to delete the email for the domain on the Classic Hosting. It took me a while to find, but the email is not under the Web Hosting, but at the Products level and is called WORKSPACE EMAIL. Click the Manage button on the right. Then, find the email address that you want to delete, hover your cursor over it, then select the Delete button. It then showed as pending deletion. I waited until the email address was completely gone from the list. Then, I logged out of the Classic hosting. Next, I logged onto the cPanel hosting. In cPanel hosting, there is actually a complete section for Email, e.g. 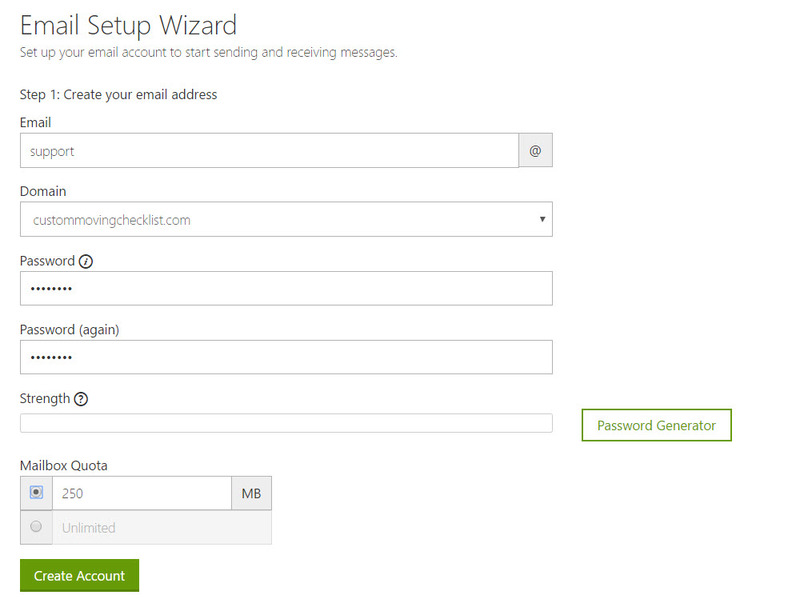 Click on ‘Email Wizard’. Then enter the email (e.g. support), domain (select from the drop-down list), enter the password you wish for this email, re-enter the same password, then select your mailbox quota. I chose 250MB for my email address because that would be plenty of space for my domain. Then, click the Create Account button. I then waited a few minutes for it to set up. Next, I went to the cPanel webmail login (https://a2plcpnl0814.prod.iad2.secureserver.net:2096/login/) and logged into my new email address. It opened up and asked me what application to use to view my email. I did some investigation and chose to use roundcube . Next, I emailed my new email address from another email that I have. The email was not received. I waited overnight before trying again. Again, it did not work. I then tried sending out an email from the new email address and it worked! So, my problem was that I was not receiving emails. Next, I called GoDaddy technical support. They investigated and determined that the M record needed to be updated. They updated this record for me and in about an hour I was receiving email properly. So, my email was fixed and working properly. The GoDaddy technical support person recommended that I call in every time I migrate my email over so that they can update the M record for me. They recommended that I call in at the time when migrating my domain over. I looked at the M record and it looks like it would be an easy change, but if GoDaddy wants me to call in, then I will call in. I was still curious so I looked at the M records in the classic hosting and there appear to be 2 records, e.g. Then, I looked at the M records in the cPanel hosting and there appear to be only 1 record, e.g. Anyways, I will still call in when doing my next email migration. I think that the information in this post will help you to minimize the down time when migrating your GoDaddy Workspace email to GoDaddy cPanel email. I have purchased a subscription to Microsoft Office and a subscription to Visio from Microsoft. When I installed Visio first, I was unable to install the Microsoft Office applications. So, I had to uninstall Visio, then install the Microsoft Office application, then re-install Visio. This isn’t too big a deal, but you would think that you could install Visio first if you wanted. The one complication with my setup is that I accidentally purchased Visio under a different Microsoft User Id because I didn’t remember that I had a previous Microsoft User Id. I am not sure if this having 2 Microsoft User Ids is the cause of this issue or not. Note: There seems to be an issue with the Microsoft logon. If you are logging on to a Business Microsoft User Id, you can’t logon using the basic Microsoft logon page. Instead, you need to go to the Microsoft Office logon page. I contacted Microsoft about combining my 2 user ids and it was not possible. I would need to cancel the one with Visio and add Visio to my account that has Microsoft Office. I am going to wait until my Visio subscription expires, then cancel that user id. If I still require Visio I will add it to the other account. Recently, I tried to use Microsoft Access 2016 on my Windows 10 computer and it was so slow, it was essentially unusable. I really needed to use Access for a project that I am working on so I had to find out why it was so slow. My PC is about 7 years old with 8 GB of RAM running the latest Windows 10 64-bit version. I frequently use the SQL Server Management studio and some of the Microsoft Office Applications (Word, Excel, OneNote) with no performance issues. So, my first inclination is that it is an issue with the Access program! Of course, I started out by doing a Google search. This provided a few results which I started to go through. 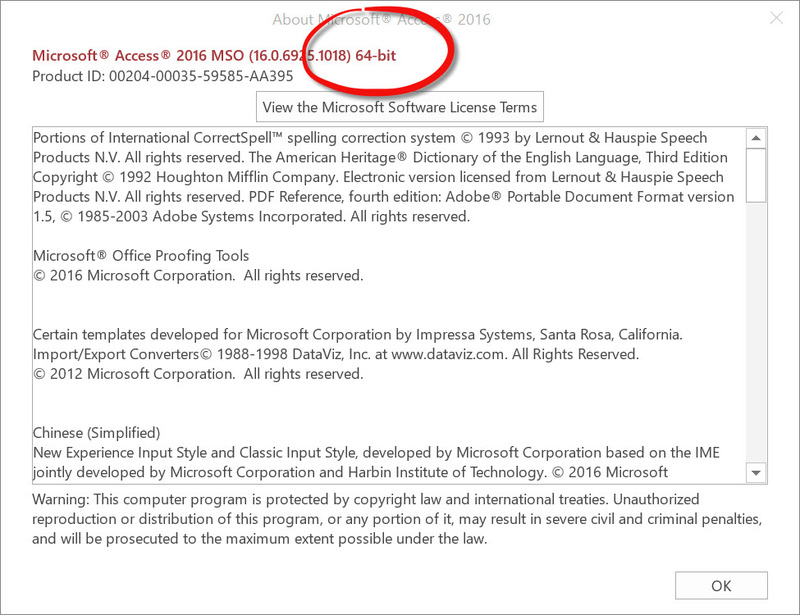 How to Find out what Version of Microsoft Access you are running. Open an existing Access database or create a new one. Select File from the Menu. Select Account from the left-side menu. Click the ‘About Access’ button. The following screen opens and shows your version. My version was showing 32-bit. So, I made the decision to upgrade it to 64-bit. This entailed signing onto my Microsoft Account from which I had purchased Office in. The first point I wanted to mention is that I would have to install the entire Microsoft Office 64-bit suite of application, rather than just Access. I selected the 64-bit Office version and started installing it. Then, I received a cryptic error message saying I couldn’t access the server. After researching this error, I did some more research just to determine that I had to uninstall the 32-bit Microsoft Office suite before installing the 64-bit versions. So, I proceeded to uninstall the Microsoft Office 32-bit version from my PC, then reinstall the 64-bit version. This failed again. At least the error message was better this time. The error message said that I still had some Microsoft Office program on my PC and had to install it. I realized now, that this had to be my version of Microsoft Visio that I had purchased using a second Microsoft account. So, I uninstalled Microsoft Visio, then installed the 64-bit version of Microsoft Office. This worked successfully! I tried Microsoft Access 2016 (64-bit) and I had the exact same performance issues as with the 32 bit version. So, this did not fix the issue. This article mentioned a bunch of things to try. First, I did the procedure mentioned in the document to tune the ClearType Text. This had no effect on the performance problem. Next, I checked my video drivers, as the document recommended. They all had the latest drivers and my video card did not have any settings that I could adjust. So, this had no effect on the performance problem. At this point, I didn’t believe that the performance problem was really related to my video. I did some testing and determined that the issue seemed to primarily resolve around the refreshing of the property windows in Access when in design mode on object. You could clearly see the property window slowly refresh whenever you clicked on an object. A number of sources mentioned that you should change all your database tables to have property ‘Subdatasheet’ as ‘None’. It defaults to ‘Auto’. I only had a couple of Access tables in my database. So, this didn’t fix the performance problem. Some sources mentioned that you should have any connected printers turned on when using Access. I turned on my printer. This didn’t fix the performance issue. After this, I changed the default printer to print to PDF just in case this had any impact…which it doesn’t seem to have any! One source, mentioned that they had problems with Trusteer Endpoint Protection when running Access. Trusteer Endpoint Protection is an anti-phising software commonly given away free by banks to their customers to use. I had installed this software a few years ago. So, just on a whim, I turned the Trusteer Endpoint Protection off. This is easily done from the Start menu-All Apps-Trusteer Endpoint Protection-Stop Trusteer Endpoint Protection. So, I tested Access again and the performance problem was gone! So, it appears that my performance problem was caused by a conflict with the Trusteer Endpoint Protection software. Turning off Trusteer Endpoint protection solved my performance issue when using Access 2016 as a developer. The problem re-emerged a few weeks later. I had started/stopped Trusteer Endpoint Protection during this period. However, stopping Trusteer Endpoint Protection did not work this time to correct the problem. I did have Visio installed under a 2nd Microsoft User Id. I uninstalled Visio and the Microsoft Access slow issues disappeared. I think now that an Office Uninstall did something to fix the problem. 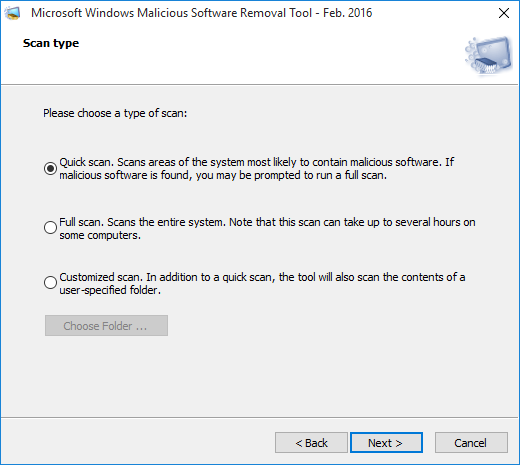 This blog will tell you how to initiate a scan of your Windows 10 computer by the Microsoft Windows Malicious Software Removal Tool. It isn’t as straightforward as you might expect! The other day I noticed that the Microsoft Malicious Software Removal Tool had tried to download, but failed a few times. I initiated the download again and this time it downloaded successfully. Then I tried to figure out how to get it to scan my computer. Surprisingly, I couldn’t find it in the list of apps in the Start menu or in any settings window. An initial Google search said that the Microsoft Malicious Software Removal Tool ran in the background. I wanted to run it right away because I just downloaded it. I did a Google search and mixed in with all the results was actually how I could run it! Type “mrt” (only the 3 letters) then enter into the Search Box at the bottom left of your screen (or Windows+S key combination), then press Enter. Press the Yes button on the window that pops up to say “Do you want to allow this app to make changes to your pc?”. You do need to be an administrator on the PC to run this app. Then the app will open. Press the Next button and this window opens. Choose either to run a quick scan, full scan, or to scan a specific folder. Press the Next button to start the scan. I first ran the quick scan which took only a few minutes. Then, I decided to run a full scan because I always turn off my PC when I am not using it, hence this tool would never be able to complete a full complete scan. And I was correct, the full scan took over 24 hours to run. After all that….no malicious software was found on my PC! 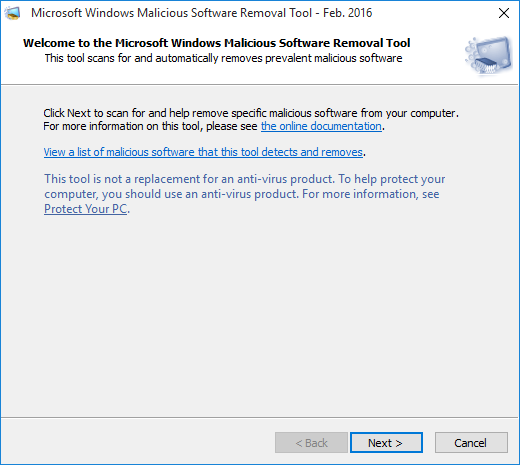 So, it is relatively easy to run a scan of your Windows 10 computer using the Microsoft Windows Malicious Software Removal Tool! I have recently been taking some training from Global Knowledge to obtain a certification. I have been taking the courses onsite in their training location in my city. I decided to take my last course using their “Virtual Classroom Live” training format, i.e. online, because the course had been cancelled at the training location and the next course wasn’t for many months. Here are some of the lessons that I learned from taking the Global Knowledge Virtual Classroom Live course. 1. Register early enough to get the reference materials. I decided to take the course using the Virtual Classroom Live format less than a week before the course started. I didn’t realize that they had to courier me the course slide book and work book. Since, I am in Canada and they are sending the reference material from the United States, I was worried that I would not get it in time. Global Knowledge was really good and send the materials out the day after I booked and I received it the following day in time for my course. So, my lesson learned is that if you are taking a Virtual Classroom Live course to book it well in advance so that you can receive your reference material before the course starts! 2. Where to find the link to the Virtual Classroom Live course? Since I was rescheduling my course I talked directly with one of the Global Knowledge representatives. She was very helpful to get me registered and how to test my computer to see if supported taking the course online. However, I forgot to ask where the link to start the course was. I looked around a bit and found what appeared to be the link in the MyGK under the “Learning” section. The link became active about 30 minutes prior to the course starting. So, the lesson learned is where the link reside and that you should test logging into the MyGK section of the Global Knowledge website prior to the course so that you know that you have access! Prior to the course starting I tested my computer to see if it would work for taking the course. To test your system, from the Global Knowledge main web page, select ‘Delivery Formats’ under the Training menu, then select ‘Virtual Classroom Live’ from the links on the left side of the web page, then select ‘Test Your System’ from the list of links on the right-side of the web page. This will immediately start testing your system and give you the results within a few minutes. For me, it recommended loading the Adobe Connect software, so I did. I don’t know what the implications would be if you don’t load the Adobe Connect software. The software was easy to load and I didn’t have any issues during the course so I would recommend loading it. So, my lesson learned is to load the Adobe Connect software. 4. Use a telephone rather than your computer’s microphone/speakers. The course I took had a number of group exercises. I used my telephone instead my computer’s microphone to listen to the course and participate in the group exercises. It was really easy to have the software call my telephone. I had a headset on my telephone so my hands were free. There were some people in my course who did not use a telephone, but rather used their computer’s microphone. These people could not participate in the group discussions. We had to communicate by chat to involve them in the group discussions. This was very difficult. Most of the people in my course were using their telephones. My lesson learned is to highly recommend to people to use their telephone when taking a Virtual Classroom Live course. Most of the people in my course were taking the course as part of a certification. Most people assumed that since the course was online, that the test would be online right at the end of the course. This was not the case. The test needs to be proctored so we had to email Global Knowledge to arrange a date and time to go into their office to take the test. Our test supposedly consists of 10 questions with a 15 minute time limit so it is not a big test! I understand that since it is for a certification that the test needs to be proctored, but I’m thinking that many people will spend more time arranging for and getting to the test taking location than the actual test will take! I also think, because of the reactions of my classmates, that they were not aware of the fact that the test was not going to happen in the course. So, my lesson learned is that you will need to schedule your test AFTER the course. Overall, I was very satisfied with the Virtual Classroom Live experience when taking my course. I would take another course using this format. It turned out that I could not take the test in the Global Knowledge training facility because they are using a third-party facility. I had to find a proctor and arrange to take the test. It took me a few hours to organize everything. The test only took 5-10 minutes and I scored 100% on it…if you were wondering!!! So, before taking a Global Knowledge Virtual Classroom Live Course ask Global Knowledge if you will be able to take the test at their facility in your city or whether you need to find your own proctor and arrange for the test which may or may not be an issue for you. Recently, I have been coding T-SQL Stored Procedures in a SQL Server database when I ran across something which should be easy to do, but probably wasn’t, that ended up actually being easy. Specifically, I had to find the most commonly occurring item in a column in a table. For example if I had a People table with a Name column with the values: Paul, Dave, Paul. Now, I want to find the value “Paul” because it occurs most frequently. So, it actually turned out to be easy! I just wanted to share this with everybody in case you run across the same situation and need a good solution. I am running Windows 7 and Google Chrome. Recently, I updated Chrome to the latest version, 38. After that I had nothing but problems with Chrome. New tabs wouldn’t open, pop-up windows would be blank and hang, etc.. It was so bad, that I started using Internet Explorer again! Finally, when I had some free time I Googled a bit, I found a fix. 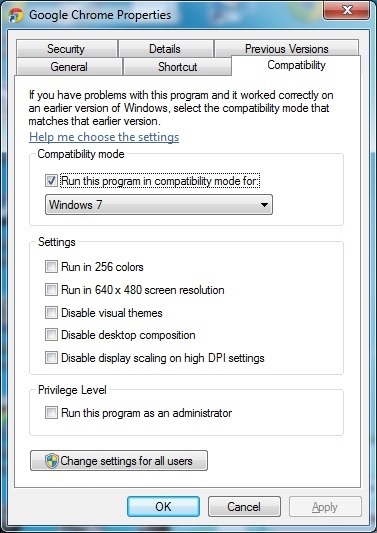 The fix is to set the Compatibility Mode to Windows 7. To do this, open the Properties (right-click on icon on Chrome icon on desktop), click on the Compatibility tab (see screen shot below), check the ‘Run this program in compatibility mode for:’ checkbox, select ‘Windows 7’ in the drop-down. Note: you can also works for Windows Vista, Windows XP, and many other versions. Since making this change, I have not had any problems using Chrome. 1. 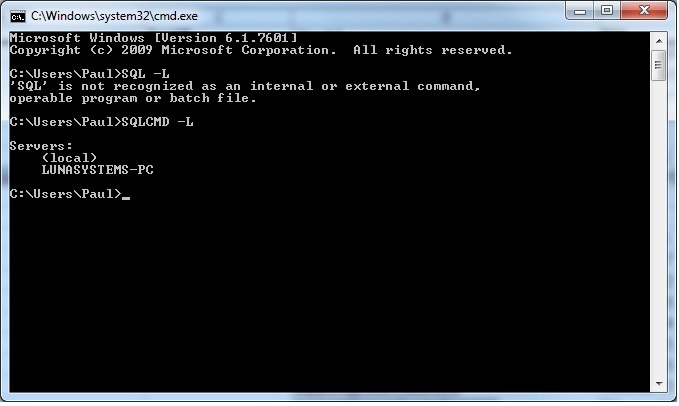 Open a Command window (In Windows 7, click Start button, enter: cmd <enter> in ‘Search programs and file’ field). 2. Enter: SQLCMD – L <enter> into the command window. Note that the ‘L’ in the -L must be a capital L.
I just started using Windows 8. One of the first questions that I had was: How do you shutdown a computer in Windows 8? Swipe or move your cursor from left to right (off screen) on the right part of your screen THEN back onto the display to display a vertical menu. This is a little tricky with a touch pad on a laptop. Click ‘Settings’ on this menu. Then, on the Settings menu, click on the ‘Power’ icon. This brings up a small menu that has an option to ‘Shutdown’. Click ‘Shutdown’ and your computer will shutdown. I was helping a friend today set up his Windows 8 laptop. He is an inexperienced computer user. He had somebody else start the set up for him a few months prior. Now, when I start up his laptop it asks me for a password. Of course, my friend doesn’t remember the password that the other person set up. I contacted the other person and they didn’t remember the password used either. So, it did show the correct email address for my friend on the log in screen which implied that a password was set up. Being fairly new to Windows 8, I didn’t see any option to reset the password so I thought I might be hooped and have to re-install the whole operating system. This would have been a problem because the operating system came pre-installed on the laptop and I had no compact discs and no software keys. So, I began trying a bunch of possible passwords that my friend may have used. None of them worked! Then, out of the blue, a message appeared that said the password could be reset at: account.live.com/password/reset . So, I went to this page and selected ‘I forgot my password’, then clicked Next. Then I had to enter some characters to prove that I was a human. Then, it asked me to confirm my friend’s email address. It sent an email to my friend’s email account. He told me the CODE to enter onto the screen. I entered the code and it let me create a new password. Then, I proceeded to log in to the laptop using the new password and it worked! I was at the main Windows 8 screen! I am just documenting this so if others have problems logging onto Windows 8 this might help them out.